(CNN) -- It sounds far too good to be true: a salary of more than $100,000, a free home on a palm-fringed island and all the snorkeling you can be bothered with. 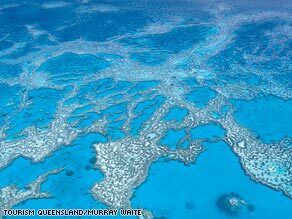 The successful applicant will have plenty of time to explore the Great Barrier Reef. However, it is true and a very clever marketing ploy to boot. Australia's Tourism Queensland has garnered worldwide media coverage by advertising the "best job in the world" -- the post of caretaker on Hamilton island in the Great Barrier Reef. The six-month contract, according to Tourism Queensland, comes with flexible working hours and the successful applicant's "key responsibilities" include exploring the area to discover what is on offer and to report back weekly via blogs, photo diaries, video updates and media interviews. The group said other responsibilities would include cleaning the pool, which comes with your free home, feeding the fish and collecting the mail (this would be done by joining the aerial postal service for a day or two to get a good view of the neighboring islands). You might also take time out from your busy schedule to check out the turtles and passing whales. On top of the six-figure salary you'll get return airfares from your nearest capital city, transport on the island, travel insurance, computer and camera gear and travel to other islands in the Great Barrier Reef. No academic qualifications are required but you must be a good swimmer and enjoy snorkeling, be adventurous and have good communication skills. Where do I sign up I hear you ask? Applications close on February 22, by which time you may be able to get on the Web site -- unsurprisingly it is proving very hard to load at the moment (not that I'm trying... that often).